I have this big celebration planned for my 99th and 100th Alcatraz crossing next Saturday, a swim from Angel Island to Alcatraz and then to the City. I have a slew of people organized for the swim and celebration. The issue is that I was only at 96 crossings. My plan was to do a bump-and-run (out to Alcatraz and back). The goal is two fold, to get to #98 and to get a long swim in before attempting the long swim this Saturday. I need to make sure my swim endurance is up. It was a few months ago that I did a 3 hour swim, however have not been working out regularly. The bump-and-run was planned for Monday. I looked at the current chart and saw a 2.2 flood dieing at about 7 AM going into a 4.0 ebb. I scheduled the swim for a 5 AM jump to avoid the strong ebb. I line up a friend to pilot me and emailed a few swimmers that have a similar pace as mine to join me and help share the cost. Including me there was a total of four swimmers including myself. My pilot’s brother asked if he could join his sister in the zodiac. Of course this is great. He has kayaked for many swims and it is good to have a second pair of eyes. The day before the swim, three things happened. First one of the swimmers backed out. I attempted to find another 4th, but could not. 3 would be easier on the pilot anyway so I did not mind. This also prompted me not to ask the pilot’s brother to kayak instead of co-pilot the zodiac. I thought 3 people would be easy enough for the zodiac to keep an eye on. This turned out to be a mistake. With a kayak the coverage would have been better even for three swimmers. Also I realized I read the currents wrong. 7 AM was the peek of the 4.0 ebb and not the end of the 2.2 flood. A bump and run with a 4.0 ebb is a much harder swim. I remembered just a couple weeks ago 1,800 swimmers did the same second stretch of our swim for the Escape from Alcatraz triathlon with the same ebb. I thought if they could do it, so could we. Game on! While a harder swim, it can also be fast. If fast I might not get in the long swim that I wanted. The 3rd thing was that I learned another group from the club was planning the same swim, but a one hour later jump. I contemplated moving ours to jump at the same time. It is better with two boats and two groups even if the groups are separate. I elected not to do this because one of our swimmers needed to be back early to get to work in Sacramento. As it turns out she swam a little longer than expected and wound up late anyway, but I get ahead of myself. So the swim was set. I picked up my pilot and her brother at her apartment at 4:15 and we headed to the club. We all got ready fast, did a quick briefing and headed out. Jump at Pier 35, bump Alcatraz and swim into Yacht Harbor. That was the plan anyway. 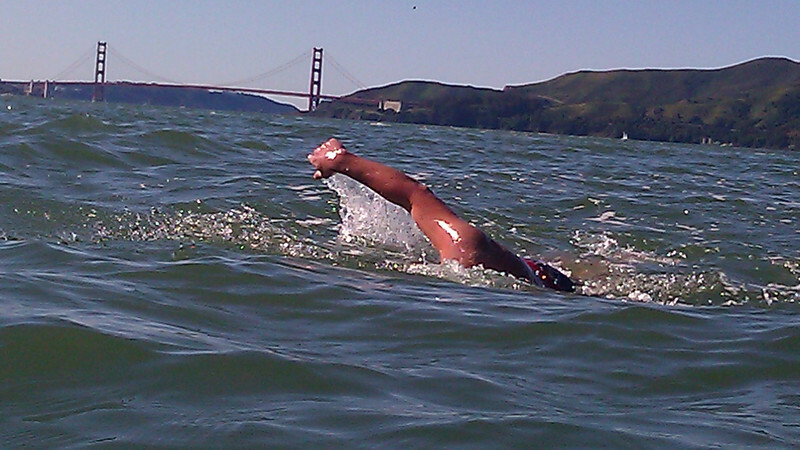 The fastest way to swim an Alcatraz crossing is to start at Pier 39 (ish) and swim out during an ebb. The current does most of the work. We sight off Point Blunt of Angel Island and swim, almost past Alcatraz until the yellow sign lines up with the chimney. Then turn into the island being careful not to swim past the yellow sign or the current will carry us around the back. So that was the idea for the first leg. I admit I’m a terrible podder. I have a hard time keeping with other swimmers. I saw the other two swimmers to my left, but they were getting further away. I was already in danger of missing the sign so rather that swim towards them I just kept on course. Well I did not make the sign. I got pretty darn close. Pilot and brother were cheering me on but the current was too strong pushing me back. I gave up and reached the island at the rocks and stood on them. “Were are the others?” I asked. “They are on the other side,” she said. I started to swim in that direction to catch up with them but then she said it was OK I could start swimming back. This was a mistake … on both of our parts. I should have been repositioned to where they were. It would not have been a loss. I was already at the island and would not have been repositioned too far away that I couldn’t count the return trip for #98. So I started swimming back while the zodiac zipped off to check on the other two swimmers. A little while later she returned and instructed me to sight more towards the east. The current was strong pushing us west rather fast. I obeyed and she zipped off again. That was the last I saw of her during the swim. The two groups of swimmers were getting too far apart. When she came back to find me again, she could not. I was on my own. It took me a while to realize that. After ten or fifteen minutes without seeing her I started to worry. I could tell I was getting swept west faster than what could be safe. The Golden Gate Bridge was getting bigger too quick. I kept going, but would stop every once in a while to look for her. Each time I stopped I would lose ground getting across before reaching the bridge. After a few time and another ten minute I had my little panic attack. I stopped and yelled for the zodiac, a sound that spread out in a circle around me only to die out before it reached any ears, how quiet our voices are at full volume when surrounded by nothing. I could feel the adrenaline rushing through my body. The shore was still far away and that damned bridge was approaching quick with the current. The bay seems mighty big when I’m alone in the middle of it, and I was heading right for the center span of the bridge. I thought if I got swept out there that that would be the end of me. I would get washed out to sea and eventually drowned. I contemplated what options I had as I was convinced I was about to be washed out to sea. Should I risk wasting my energy swimming or should I just sit there treading water until someone found me? The Marin headlands looked closer than the San Francisco shore, perhaps I could reach there. I was resigning to the fact that I was going out to sea and even began contemplating my death. Would this be the end? Would I be the one South End swimmer that loses his life in the bay? “Swim … I must swim!” I told myself. This is all on me now. I cannot count on anyone rescuing me. If I’m to survive I have to do it myself. I cannot afford to panic. Panic is the real demon here. It can take a strong swimmer and turn him into a drowning baby in the bay. I must let it go. I could also not afford to get fatigued. All I could afford to do is swim. I put my head in the water and swam. I did not look up again for a boat to rescue me. I did not look at the bridge. I kept my breathing to the left. It’s a “Do no look down” sort of scenario. I did not want to see how close to the bridge I was getting or it might induce more panic. Knowing how close it was would not help me any. I was going to cross under the bridge wherever I was whether I knew where it was or not. My goal was to get to the south tower and hang onto or climb up on it until someone found me. I learned later this is not a good idea because the currents can pull people under, so it is a good thing I missed it. But I’m getting ahead of myself again. Once I got over the panic attack I was strong. I have swum for three hours before. I knew I could do it again. I didn’t have water or nutrition, but have also done long swims without them in the past. I knew I could do it again. I also wasn’t worried about the cold. The water temperature had warmed up enough that I could stay in it for a long time. Being hit by a boat didn’t worry me. Heck if there was a boat in sight I would be grateful … perhaps for a rescue. Even if I missed the south tower (which you already know I did), there was Baker Beach. While it is a ways away south from the bridge, there is a back eddy there. Once I reached the back eddy I would no longer be washing out to sea with the current. I had just kayaked some swimmers to Baker Beach just two days prior so I was familiar with these currents. I began to relax and even enjoy myself. It is not often I get to just swim without the concern of other swimmers or pilots giving me instructions, sometimes in contradiction to what I wanted to do. Yes, there was a certain freedom in my experience. As I swam, I kept my sighting perpendicular to the shore. I wanted to go in as short a line as possible. I thought this was better than trying to swim towards the east and fight the current to gain a little time against the ebb, even if that little bit of time gained might help me make my goal of the south tower. It would be Ok if I missed the tower. Miss it I did. I don’t know how long I was swimming. Even breathing to my left I could see the south tower getting closer and realized I was getting too close to the bridge to reach it. Under the bridge I went with the current. That’s OK. Plan B = Baker Beach. I was still feeling strong. The only setback was that the water can get quite rough on the other side of the bridge, making swimming a little more challenging. Luckily, I was blessed with calm water. There was only one fright when under the water I sighted the red blob of a nettle jellyfish. These are the stinging kind! Just as I sighted it my hand hit it on the top of the head, not where the stinging tentacles are. A few seconds later I felt my foot kick it … again on the head. I panicked a bit not knowing how many of its friends were with him. “That’s panic,” I reminded myself and let it go. I was still only breathing only on the left side. Once on the other side of the bridge I could see how much southern progress I was making as I kept eye on the features of the bridge and watched them pass. This was comforting. Soon I was passed the south tower, and while later I could feel the water getting choppy. That was a sign that I was crossing the current line into the back eddy. Then it calmed down. I stopped and looked up. It seemed so still. No more current rushing me out the gate to a death at sea. I was happy. I could see the familiar landmarks of Baker Beach. Just two days before I kayaked a few swimmers into Baker Beach so I was familiar with the water and landmarks. “How fun it would be to swim into Baker Beach,” I thought after kayaking those swimmers that other day. Now it looked like I was going to get my chance. What I was going to do once I got there I don’t know. Me standing on the beach with nothing but a swim suit, cap and goggles … earplugs too. I figured I would hike up to the road and flag down a vehicle. This plan would not be needed however as I saw a small fishing boat about 200 yards to the left near the shore. I contemplated “fishing boat or beach?” I knew there were people on the boat so headed in that direction. I waved my arms at them and swam up. “I’m lost” I told them, “Can I come on board.” They were Asian men. I wondered for a second that they might not speak English, but the reply came in English, “Yes.” “Do you have a radio?” I asked as they were helping me on board. “Cell phone” he said. I situated myself on a seat in the front of the boat. He handed me his cell phone and his warm coat. I immediately called the Coast Guard … 411 first to get the number. I couldn’t get vessel traffic, who I knew was on the radio and could reach the zodiac, so I called the general San Francisco Coast Guard number. “I’m a swimmer that got lost, I don’t know if I’ve been reported lost.” They did not have a lost swimmer report. This made me a little mad. I explained to them the situation and asked them to call the zodiac and the South End Rowing club. They said they’d do their best. I learned later from the pilot’s brother that they did report us lost after about forty minutes that they last saw us. There seemed to be a communication breakdown between the Coast Guard, vessel traffic and the zodiac. After a little while I got a call back from Robin from the club. I explained to her the situation. She said she see what she could do. Not knowing what had happened, I had pictured that the zodiac would have picked up the other two swimmers by now and may have given up on me and called the Coast Guard. I wanted people to call her or the other swimmers to let them know I was alright. I was not sure how I’d get home though. The time on the cell phone said 7:30. We jumped at 5:10. So I was swimming for 2 hours 20 minutes. That’s a pretty good haul. I made it to the shore … or close enough, so I would count this as #98. Also I got in a long swim too! My swim endurance seems good enough for the swim next weekend. So then I just sat there for a while … cell phone in hand. I was shivering. Are you OK? The fisherman asked. “Yes,” I replied. I knew the shivering would stop soon. The water was not that cold as the season was warming and I was not too uncomfortable with the post-swim shivering. “Do you want some water and a sandwich?” he asked. I took him up on that without hesitation. It’s funny how I do not know anyone’s phone number. With cell phones, we do not use numbers anymore, just click on their name and the call is made. I was sitting there with that cell phone and did not know anyone’s number that I could call. Tina! I knew Tina’s number only because when I got mad at her last year I took her out of my contacts. Every communication we had after that came up with her number instead of her name and I memorized it that way. I got her answering service. I left a message about what happened and asked her to call the pilot and the other swimmers and let them know I was OK.
Then I remember 411 again. I tried to find a listing for the other swimmers, but could not. I tried our zodiac pilot and got her mom. I explained the situation to her mom and asked for her cell phone number. She dug it up and read it to me. I did not have anything to write with (something I do not think to carry when I swim). I tried to memorize it but did not do a good job and did not connect. That was the last call I attempted to make … except Tina a few more times. “How long do you guys stay out here?” I asked the fishermen? “Until we catch our limit,” He replied. He told me they were from Oakland. I didn’t know how I was going to get back. I could hang out there all day if I needed to. I might end up sunburned though. They had an extra fishing pole. Perhaps I could fish with them? Oh, but I don’t have a fishing license. All I could do is sit there. A lot of time went by before the phone rang. It was the Coast Guard. They told me they were in touch with the zodiac and let them know I was safe. A few minutes later I spotted a small craft coming under the bridge. “That could be them,” I thought. I heard someone call my name. “That’s strange,” I thought, “They are too far to be calling my name. I looked around and did not see any boats near by. “Jay,” the voice said again. Then I spotted the two yellow caps in the water. They were still swimming! My God, I was out of the water for and hour already and they are still in it! No zodiac in sight. The fishermen zipped over to pick them up. They were no longer concerned with fishing anymore and reel their lines up into the boat. After picking them up they started bringing us in under the Golden Gate Bridge. I was plenty warm so took off the coat for one of the swimmers. The wind chill was a little unpleasant on my bare skin, but I could live with it. The phone rang again. It was our pilot’s brother in the zodiac. We had contact! He said they were looking for us near Crissy Field. I told the fishermen and they steered us in that direction. There were lots of boats out there. I learned later the Coast Guard issued a mayday for three lost swimmers. Boats came out from all over to look for us. We reunited with our zodiac. There was also the second zodiac from the other group that had already successfully completed the very same swim we were attempting. The zodiac came back out to help look. We divided up between the two zodiacs and departed back to the club. I was still feeling mad at our pilot so got in the other zodiac. When we were back on the dock I caught our pilot’s eyes and could see the sorrow and regret. We fell into a tearful embrace. My anger dissipated. I learned later that the two groups of swimmers were getting too far apart. She was moving back and forth between us. Then one time when she came to find me, she could not. She went back to find the other two and then could not find them either. We were all lost! The current was moving us much faster that she estimated and wound up looking for use too far east while we were getting swept west. The problem was us being spilt up and/or not having a kayak. So many lessons to learn! She told me that while she was worried sick she knew we were all strong swimmers and that we could make it. She was looking for us by Crissy field. It never dawned on her that we would go beyond the Golden Gate Bridge. If you look at the map below it seems unlikely that we would. The bridge is almost in a straight line directly west. It looks as though in order to get there that we were making no progress south at all. I also learned in later conversations that because I called her mother that they were able to get a hold of me. Her mom called the brother. The brother said, “I can’t talk now Mom we have a situation here.” The mom said, “I know you have a situation.” The brother instructed her how to retrieve the phone number for the fisherman’s cell phone from the records. That was when I received the call from them. Back at the club everyone seemed aware of the situation. I was a little embarrassed and ashamed. Glad we were all safe though. Things happen to teach us a lesson. As long as no one ends up hurt or institutionalized I’m happy to learn the lesson. I look back at the decisions I could have made differently. I think next time I’ll error to the conservative side. Better to be safe to swim another day. This entry was posted in What Happened and tagged Swimming, Triathlon on July 31, 2011 by jligda. The swim started at Mile Rock in San Francisco. Six swimmers with three kayaks. The water proved to be too rough out there so swimmers and kayakers were gather up by our support boat (the Dauntless) and repositioned to the Golden Gate Bridge. The destination Candlestick Point. The currents were not strong enough to support us reaching Candlestick Point. One swimmer made it passed the Bay Bridge. The rest almost made it to the bridge. This entry was posted in Video and tagged Swimming on May 1, 2011 by jligda. The route was from Point Bonita to San Quentin … 12 miles. Seven swimmers with support from four kayaks and one big boat. Six swimmers start at Point Bonita, one at Kirby Cove. Five make it through the end of Raccoon Strait. Two swim for four hours and almost reach the destination. This entry was posted in Video and tagged Swimming on April 23, 2011 by jligda. 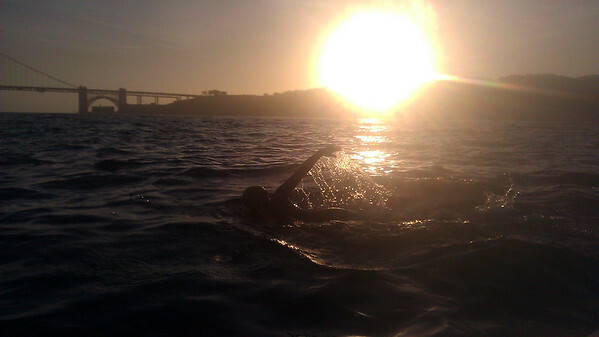 ‎9 swimmers with support of The Dauntless and 4 kayakers set out to swim from Candlestick Point to Mile Rock (15 miles) or until their arms fell off. After the Bay Bridge 5 swimmers remained. The water was cold due to snow runoff. Our non wetsuited swimmers could not stay in as long. The rest of the 5 made it as far as Alcatraz before the current switched directions stopping them dead in their tracks. This entry was posted in Video and tagged Swimming on April 2, 2011 by jligda. This entry was posted in Video and tagged Swimming on February 27, 2011 by jligda. This entry was posted in Video and tagged Swimming on December 5, 2010 by jligda.